Command line utilities must not be used in parallel with a WEB application. channel     Channel to generate signal on [1, 2]. amplitude   Peak-to-peak signal amplitude in Vpp [0.0 - 2.0]. frequency   Signal frequency in Hz [0.0 - 6.2e+07]. type        Signal type [sine, sqr, tri]. freq float 0 - 620000001 [Hz] Frequency can be generated from 0 Hz (DC signal) on*. <type> string sine / sqr / tri Optional parameter. Signal shape type (sine – sine wave signal, sqr – square signal, tri – triangular signal). If omitted, sine is used. The output can be disabled by setting the amplitude parameter to zero. Signal generator output impedance is 50 Ω. If user wants to connect the output of the signal generator (OUT1, OUT2) to the Red Pitaya input (IN1, IN2), 50 Ω terminations should be connected at the Red Pitaya inputs through the T-type connector. size     Number of samples to acquire [0 - 16384]. size int 0 - 16384 The number of samples to read. dec int 1, 8, 64, 1024, 8192, 16384 Optional parameter. It specifies the decimation factor. If omitted, 1 is used (no decimation). Acquire utility will return the requested number of samples with decimation factor for both input channels (column 1 = Channel1; column 2 = Channel2). The /opt file-system on Red Pitaya, representing the SD card, is mounted read-only. To save the data locally on Red Pitaya redirect the acquisition to a file in the /tmp directory. The /tmp directory resides in RAM and is therefore volatile (clears on reboot). Type the Red Pitaya password (next Figure). 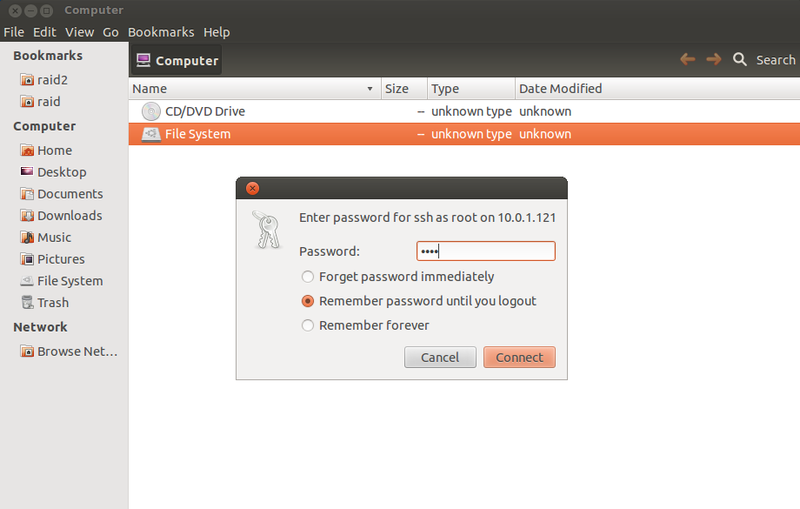 The default Red Pitaya password for the root account is »root«. For changing the root password, refer to buildroot configuration - a mechanism for building the Red Pitaya root file-system, including the /etc/passwd file hosing the root password. 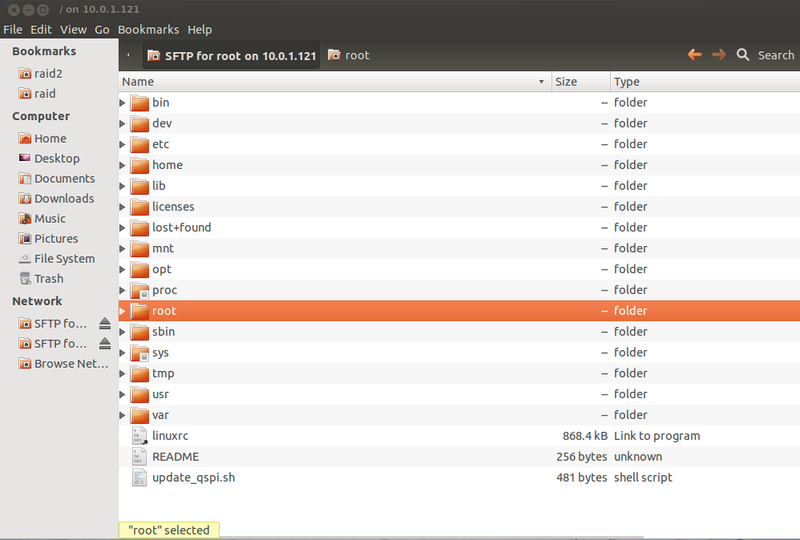 After logging in, the main screen will show the directory content of Red Pitaya’s root filesystem. Navigate to select your stored data and use the intuitive copy-paste and drag & drop principles to manipulate the files on Red Pitaya (see next Figure). 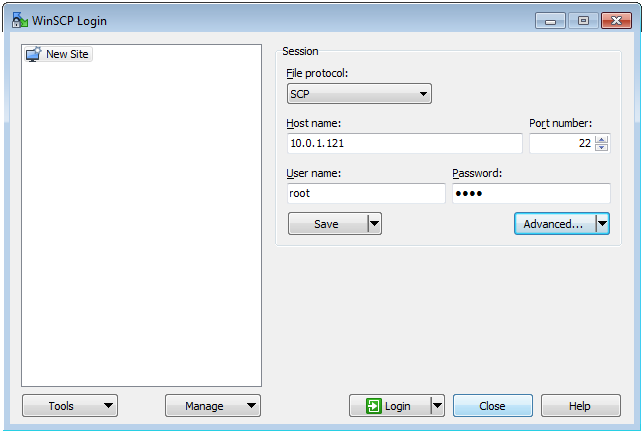 Windows users should use an SCP client such as WinSCP. Download and install it, following its installation instructions. To log in to Red Pitaya, see example screen in next Figure. After logging in, the main screen will show the content of the Red Pitaya root filesystem. Navigate to select your stored data and use the intuitive copy-paste and drag & drop principles to manipulate the files on Red Pitaya (see next Figure). Figure: Directory content on Red Pitaya. Select the destination (local) directory to save the data file to (see next Figure). Figure: Select file copy destination. The CPU algorithms communicate with FPGA through these registers. Therefore, the user should be aware of a possible interference with Red Pitaya applications, reading or acting upon these same FPGA registers. For simple tasks, however, the monitor utility can be used by high level scripts (Bash, Python, Matlab…) to communicate directly with FPGA if necessary.